1. 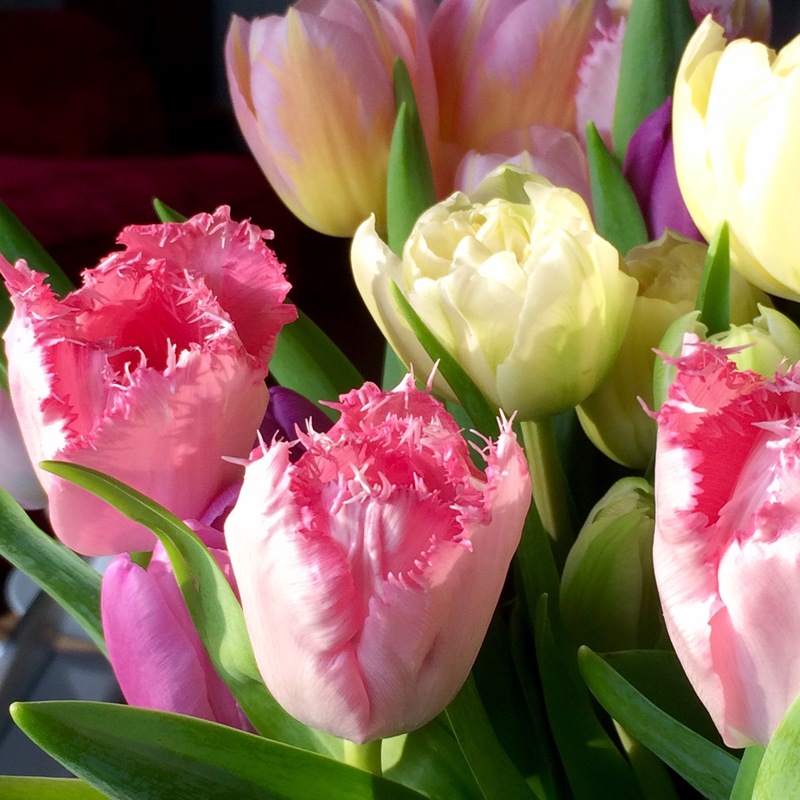 Last Sunday, 26th March, was Mother’s Day in the UK, and I was given these beautiful tulips by my children. 2. They came in this lovely jug with a rustic heart motif on the front which, unfortunately, hasn’t photographed very well. 3. 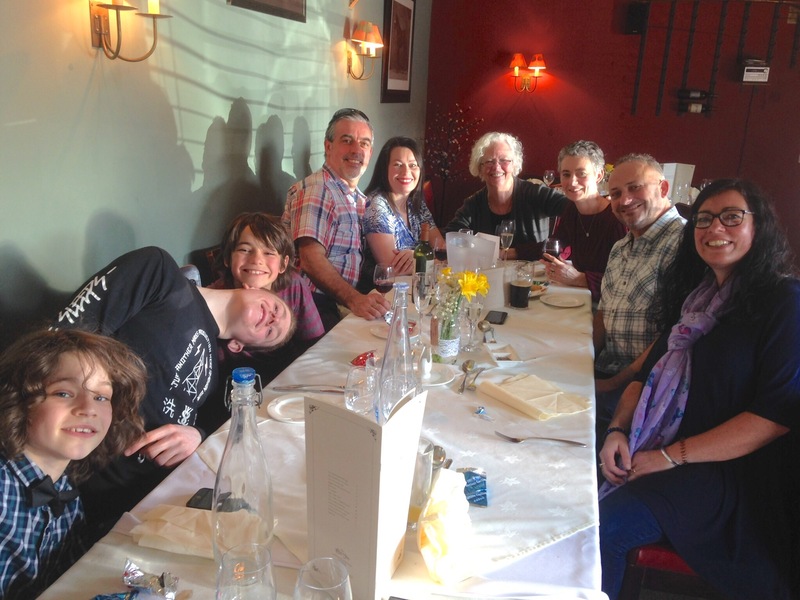 A lovely Sunday roast with the family at our local pub. 4. I’m ferrying No.1 Son to and from his physio appointments since his knee op. Progress is good and he should be able to drive again in a week or two. Luckily, his job allows him to work largely from home otherwise he would have had to take six weeks off. 5. Did you spot a dog curled up on a cushion in the photo above? 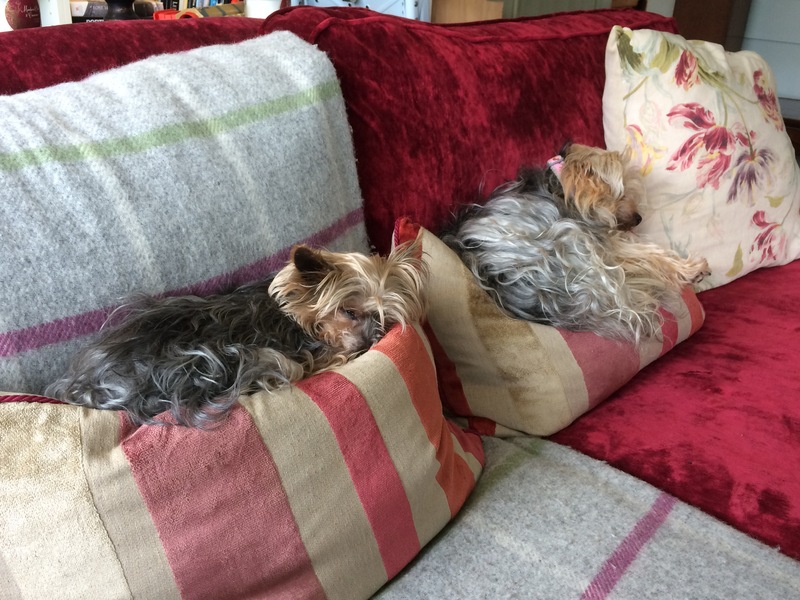 Apparently, a soft velvet sofa isn’t quite good enough for our two Yorkies. They prefer to fashion individual nests out of the feather cushions. 6. 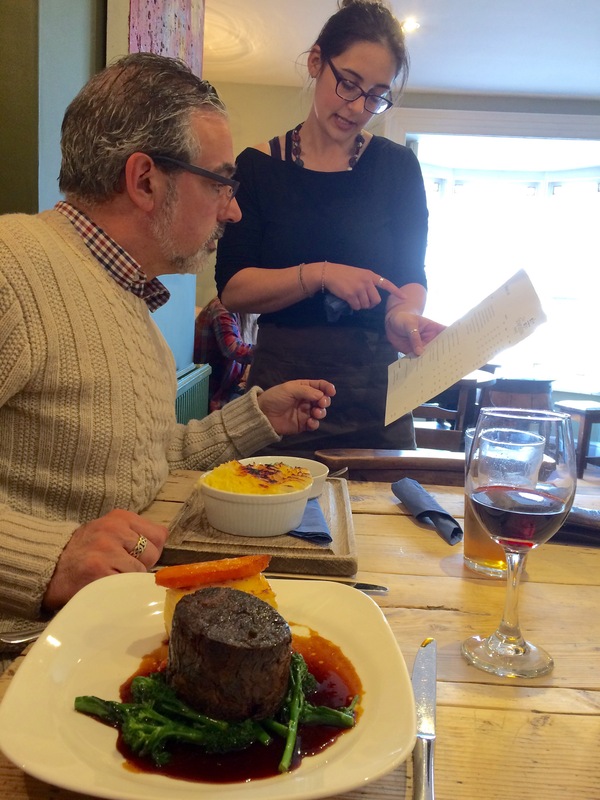 Mr. H-L choosing something appropriate from the wine menu to go with his fish pie and my blade of beef when we went out for a pub lunch midweek. 7. 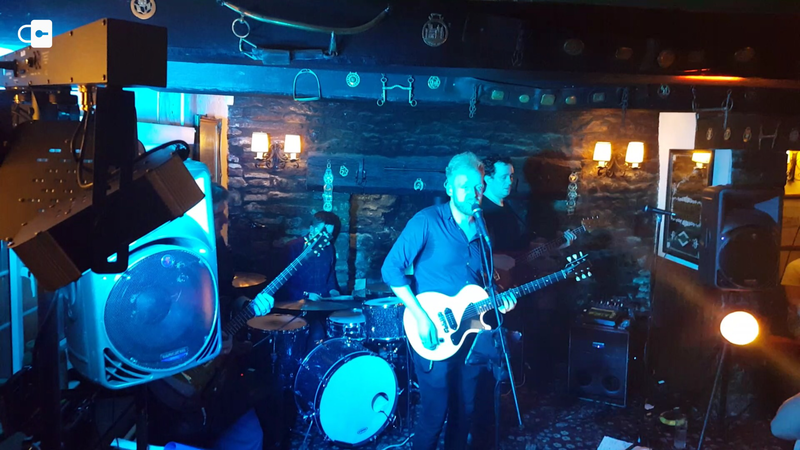 Friday night was my nephew’s 18th birthday and it just so happened that a band was playing in their local pub. 8. The day after the night before……pie and mash to soak up the previous evening’s excesses. 9. 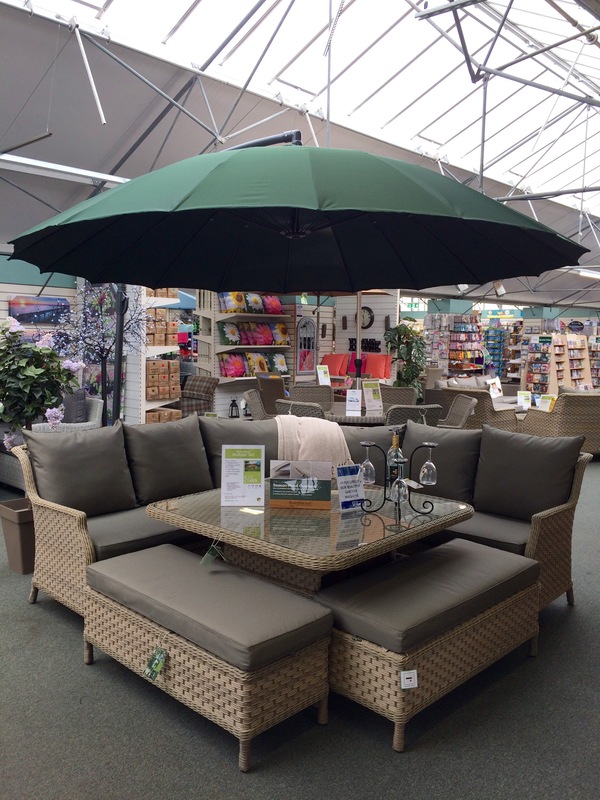 I went in to buy three 50p sheets of felt and then saw this set of garden furniture in the garden centre……. 10. ………yep, quite happy with the way it now looks in our garden! 11. 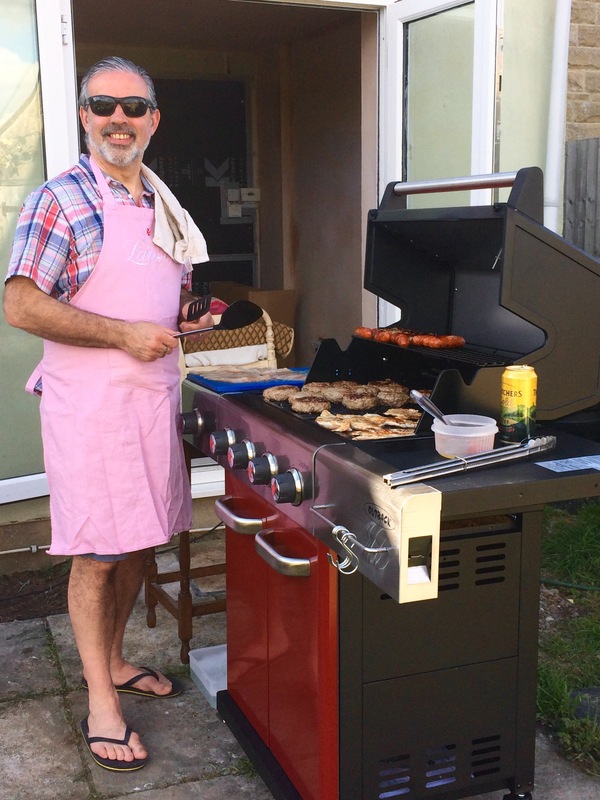 Mr. H-L put on his best pinny and did himself proud with a barbecue. 12. 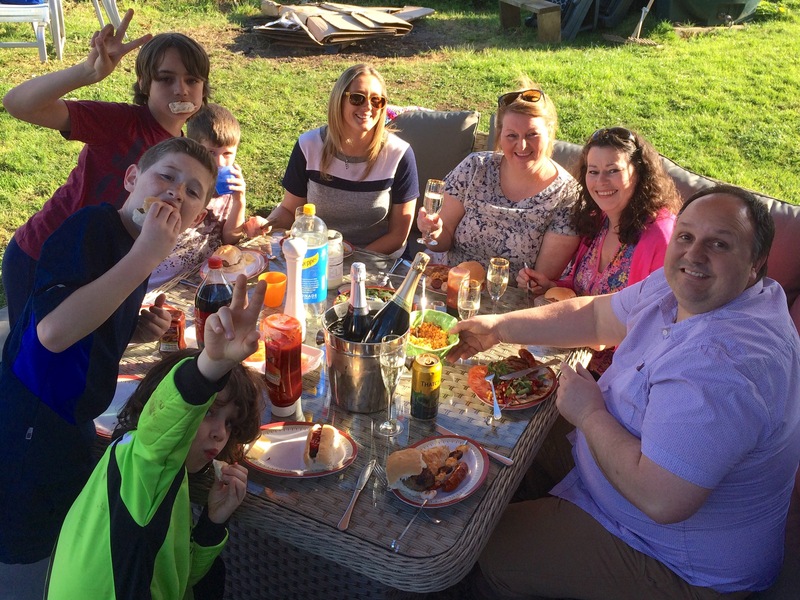 The perfect way to christen the new furniture – invite some good friends around to enjoy the barbecue with us! 13. 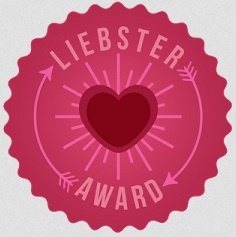 You may have noticed the lack of anything crafty in this week’s post. 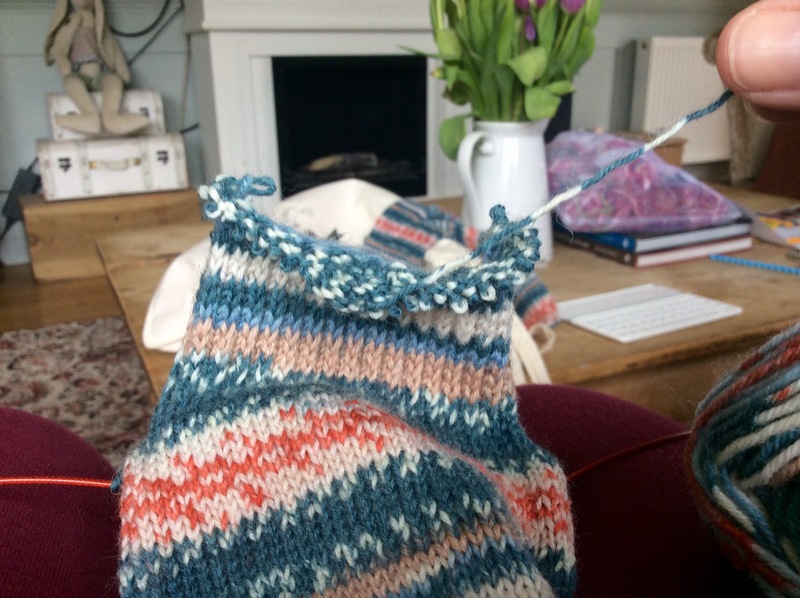 In fact, progress on the socks went backwards as I had to frog a whole evening’s work back to an earlier mistake before picking up the stitches and trying again – infuriating. Linking up with Natalie from Threads & Bobbins, Sunday Sevens is a weekly blog series showing your week in seven-ish photos. Categories: Everything Else!, Sunday Sevens | Tags: barbecue, BBQ, garden furniture, mother's day | Permalink. Ours also have their own cushions, blanket and beds – not that you’d know it as they always curl up on ours! Your dogs define cute!!! A lovely social week by the look of it. Our last set lasted about 12 years and has now been passed on to my daughter as there’s still life in it yet. We wanted something to lounge in as well as a table to eat at – this is perfect and means you can spend much longer outside. Fabulous week, I can’t believe the weather you must have had. We had sunshine but it certainly wasn’t shorts and bbq weather! Love the dogs take over of your cushions. It reached 20 degrees at one point! Admittedly, we did have the fire lit in the evening which enabled us to stay out until 10pm. 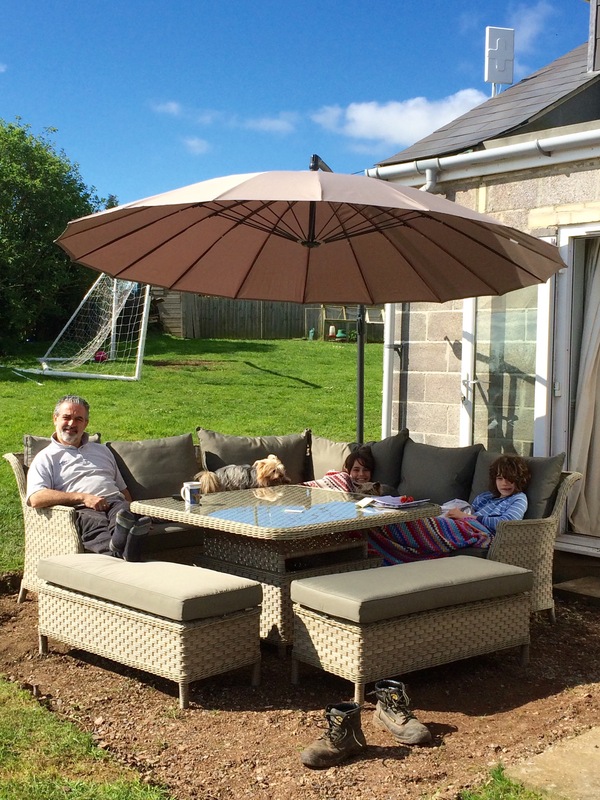 The Dogs have now taken over the garden furniture, too…. 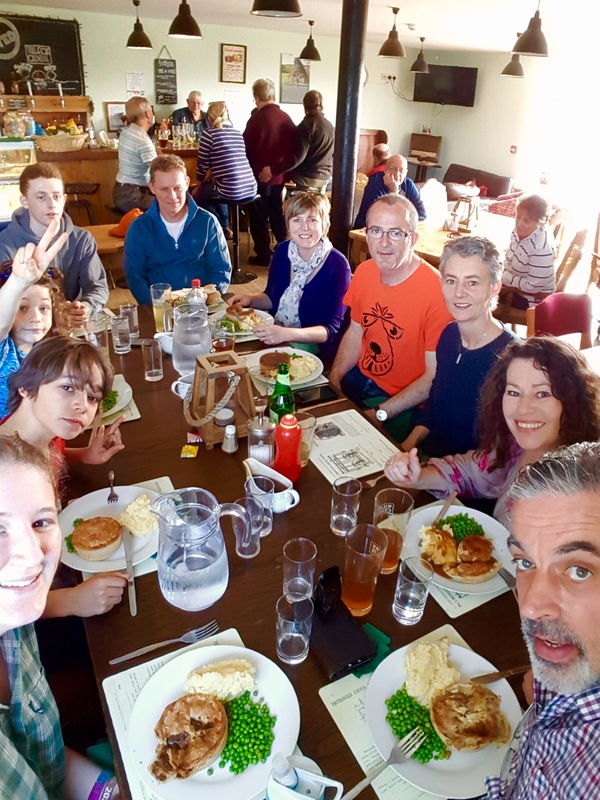 Sometimes crafting just has to take a back seat to the really important things in life, like dining out, mothers day, pub food, shopping, good friends, food, wine, puppies comfort and – er – good bbq food! 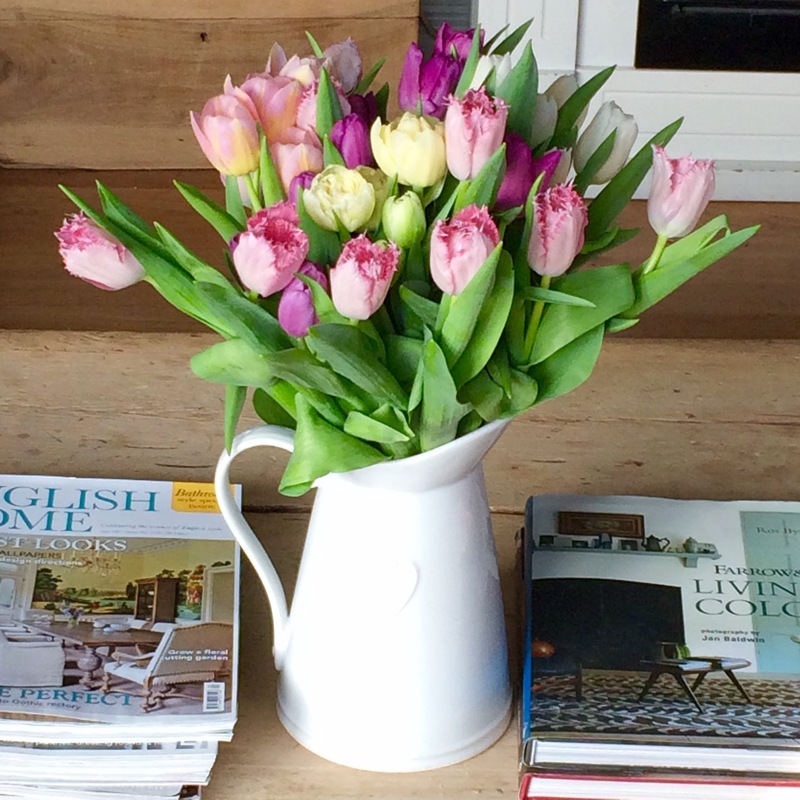 Love your pitcher of tulips! You’re absolutely right, of course, and the sock knitting was going on in the background. 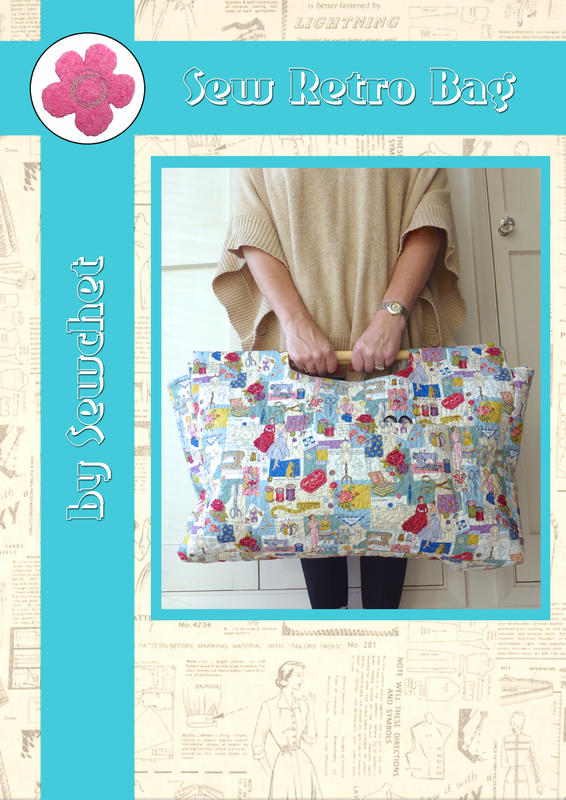 It wasn’t a week to sit at the sewing machine though, and some lovely family time was had. I love your new furniture, just stunning. And perfect for the Bbq, so why not. Stunning flowers, and so cheerful. All the best to Son no. 1, hope all is well again in now time. 🙂 Those two, and curled up on the cushions. So super cute. Miekie would love to follow their example. Have a great week and all the best with the crafting, it does look pretty complicated but absolutely stunning. We bought the last available set of that particular set of furniture – I would have kicked myself if we’d left it too late as it is just the job for our needs. I do love flowers around the house and I have been lucky enough to have been bought three bouquets this week, so they’re everywhere! No.1 Son is improving daily – he misses his car more than anything. Independence is something we take for granted, I think. Thankfully the knitting is sorted, finished and I’ve moved on to the next project already! It is so good when you find something that is exactly what you needed or were looking for. 🙂 You always feel like you are enjoying it even more. I think I feel the same way about plants. I love plants around the house, and loads outside. I always seem to have potted plants to rotate and keep them in flower. Indeed, we all get very independent, and sometimes feel guilty when having to ask others to help us out. Just happy to hear is making good progress. 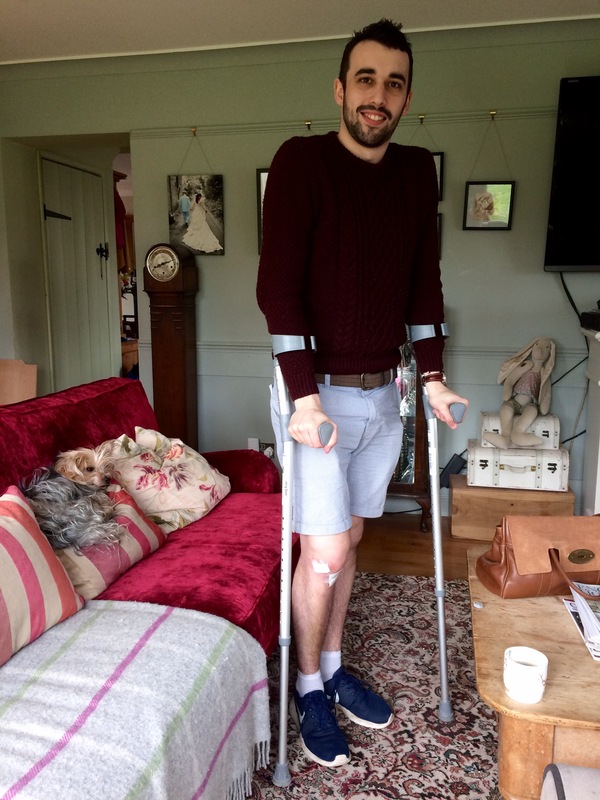 Sorry to hear about the frogging, but otherwise a fab week 🙂 Glad No.1 son is mending well. Not surprised you’ve been outside so much to eat with such gorgeous new furniture. Must show LH to see if I can inspire him to replace ours with something as nice. Mind, looking at those pics, you’ve definitely had way better weather! The frogging has been sorted, socks finished and I’ve moved on to the next pair now! Oh, that furniture – we LOVE it! Our old set was passed on to our daughter as there was still a few years left in it, but it was just a dining table and chairs for 4 people – this seats 10 in comfort! I shall miss my daybed covered in all those patchwork quilts, though. It’s cooler now, only 13 degrees, but still sunny enough to sit out with a blanket at the ready. We’ve spent the last few days on Exmoor – has Dartmoor been as lovely, weather-wise? Dartmoor is an easy day trip from Exmoor, so regular meet ups would be on the agenda, I feel! Definitely! And wouldn’t take too much longer to get to parts of Exmoor than parts of Dartmoor that are on the opposite side of Dartmoor to us. Great week of pictures – slightly jealous that my own No 1 son, my only son, my only child, is living away and just posted me a card! Loving those curly dogs, like my own cats, they prefer our sofa space too. Looks like the weather was with you to be enjoyed last week. Lovely ! Garden furniture looks great! your little dogs know how to find a comfy spot! The Dogs are definitely spoiled – they’ve already taken over the garden furniture too! Hubby laughed when I told him, but then sent me back to buy a new barbecue too! We nearly bought a new set last year, but since then one of the chairs broke, so it has now been passed on to our daughter and we treated ourselves to this new set. Lovely it is, too, and is already being properly used! The socks are now finished and a new pair has been cast on. I’m glad I bothered to fix the mistake as it would have bugged me otherwise and it only took an evening to put right. LOL! A new season and a new garden start…maybe he has been secretly mastering new barbecue recipes ? ?..look forward to his ‘chef’s’ skills on future posts!! I knew you would have finished them by now ; -) even though I couldn’t see the error, I know what you mean about it bugging you….now you can wear them with pride!! They’re a Christmas present for someone in the family but, even if she couldn’t see the mistake, I would know it was there. Silly, really, but I think most of us are like that! Rather than a lifetime of a niggled brain 😉 I’m sure they will be much loved! Ha ha! Yes, I did remember the felt, but we ended up buying a new barbecue too, so it was quite an expensive visit to the garden centre!! So fun! Love that new patio furniture! Looks like a fun week! Hope your son’s knee is healing nicely! His knee is healing nicely, thank you. And what better way to rest up than a bbq in the sunshine with your feet up on nice new furniture?! Yup, yours is the same furniture but I think your cushions are darker, and look a bit more practical that ours which are light grey. Looks like a lovely day! I am so jealous of your new patio set- it’s beautiful.